Hallowe'en candy has been in the shops for months now, so retailers must feel that it's not too early to trot out the Christmas greeting cards. I'm old school and love sending *actual* cards each December (yes, with stamps too), so I was intrigued by this set. All Victorian retro cool EXCEPT for the snow white, bold shouty message on each one. 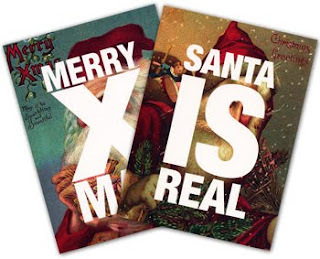 I do appreciate the 'Santa is Real' exclamation but it totally obscures the quaint Victorian image. Why bother putting such old illustrations on the cards if the manufacturer is going to gunk it up with oversized text? Kinda ruins the spirit and the message that was intended especially as the inside of these cards is blank! The designers of these cards had a major brain fart, I think.